In an attempt to prevent insolvencies and corporate collapses in the Queensland building and construction industry, the Queensland Building Construction Commission (QBCC) have implemented new reporting laws. 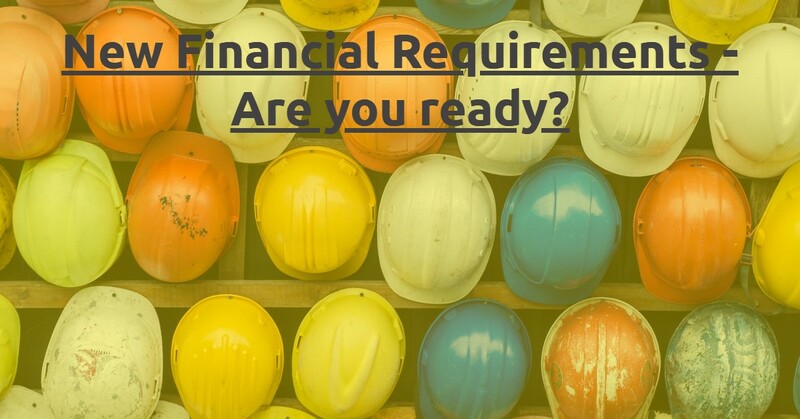 The new regulations for Minimum Financial Requirements (MFR) commenced on the 1st of January 2019 and will coincide with the existing MFR policy introduced in October 2014. Under the new laws, if you hold a contractor grade QBCC licence you will be required to meet annual financial reporting obligations. Self-Certification Category 1 (SC1) Up to $200,000 $12,000 Declare revenue and NET tanglible assets in the online portal. If you fall under Categories 1 to 3, there is no immediate action required. Your first financial information report will need to be lodged with the QBCC by 31 December 2019. In early 2019 they will inform you of their requirements and issue guidance on the new requirements. Businesses who fall under categories 4 to 7 will be required to submit financial statements to QBCC for the last financial year by 31 March 2019. The financial statements will need to include all reports listed in the above table. If you are already proving your annual ASX or ASIC reports to the QBCC, then you will not be required to provide a separate report. If you are a new licensee, the QBCC will notify you of your reporting due dates when your license is approved. How Do I Submit my Reports? You will be able to submit your information via your my QBCC portal here. If you have any queries in relation to this, please contact our team today! Call us on 07 3226 1800 or send us a message through our Contact page.